Education was a major concern of J. Krishnamurti, a radical thinker and educator. For him, the development of the total individual was important, rather than only knowledge and skills. 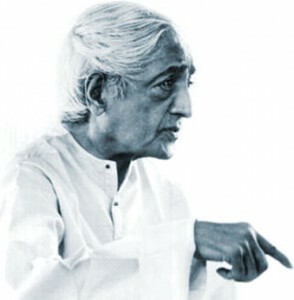 J Krishnamurti is now considered to be one of the most radical thinkers and educators of recent times. Travelling the world over for a period of more than six decades, he pointed out the urgent need for a transformation of the psyche, without which the survival of humanity would be threatened. This transformation included a deep inquiry into the nature of the self. Education, a central concern of his, is an integral part of such an inquiry. He held wide-ranging talks and discussions with thinkers, teachers and students on the significance of right education. In a world in which true morality seemed to be fast disappearing, it was of vital importance to him that educators and young minds engage with questions that were fundamental to the human psyche – the nature of fear, prejudice and violence. Educators and teachers were challenged to respond to these questions not just intellectually, but with the whole of their attention. The total development of the individual student is possible only if she can be helped to know her own deep capacities. Comparing one student with another does not bring about knowledge of the deeper capacities of the child. Comparison and competition have generally been seen as stimuli to learning, but they only breed envy, insecurity and fear. As most parents would like their children to have successful careers, this method has been used without the need to find out what the student’s deeper interests are. How should the teacher help a student be very sensitive? In his talks and writings to students, Krishnamurti often drew their attention to listening, looking and observation, especially while in themidst of natural surroundings. Listening very attentively to the song of the bird, looking at its shape and colour, completely, without the intrusion of thoughts and feelings; looking at the flow of the river without wanting to do anything about it, brings about freedom of observation. Consider a classroom situation, in which children are instructed to learn from books. Traditionally, a child is instructed to concentrate on her lesson; otherwise, there is no learning. However, if the child’s gaze moves to a lizard on the wall, her gaze could be allowed to rest there as she perhaps watches the shape, colour and movements of the lizard with an intensity of interest that the book cannot evoke. Freedom, however, does not mean doing what one likes. “If you say ‘I will do what I like. I will turn up for my meals when I like; I will come to the class when I like…’ – you create disorder.” (K on Education, p.38) Taking others into consideration, being polite, and concerned about other people, is all part of order, which brings about freedom. These questions are a small sample of the vast number of talks, dialogues and discussions that Krishnamurti held with educators, teachers and students. While he never denied the need for developing a sharp, clear and critical mind, he saw the central concern of education as the development of the whole human being, capable of looking at his own problems, and that of society and the world, with clarity and sensitivity. Deepa Onkar has been a teacher at CFL, Bangalore, and is an editor based in Chennai. She can be reached at donks71@yahoo.co.uk.